Two emotions drive every aspect of human life. One binds, the other separates. Love draws together. Fear pushes apart. Both emotions exist in our heart, battling for control over our actions and reactions on a daily basis. For me, years went by before I became cognizant of the emotional power play in my heart as it relates to parenting. When situations became sticky, my psyche too easily fell under siege while disciplining my kids, advising them on decisions, or teaching them about life. I love my kids deeply and never considered my actions brewing from any source other than love. The problem is, fear often initiates a preemptive strike, tossing a grenade in the bunker of our adoring. The attack happens for many reasons. Including a lack of understanding and knowledge, inability to relate, or – a biggie for me – the disease of past experiences bleeding into our present circumstances. Mindful discernment regarding our emotional state gives us pause to reflect on the attitude of our heart as we go through our days loving on our kids and making parental decisions. Self-discovery holds up a temporary white flag, enabling us to change the course of the battle plan if we see fear barking out marching orders. My personal skirmish between love and fear in my mom heart began as a little stick fight when my kids were young, evolving into a full-fledged war as my kids have grown. Of course I worried about their safety, health, and emotional well-being through various ages and stages in the developmental years. Panic trips to the doctor after only one day of the sniffles, head-to-toe armored gear before bike rides, and reading the “What to Expect…” series, volumes one through a hundred, over and over. I could have just waited a few days for the boogs to dry up, decided a concussion was the only thing worry-worthy instead of every scrape and bruise, and simply enjoyed each phase as it came instead of fretting over whether my kid fell on the “normal” end of the spectrum. Middle school ushered in drama, bullying, and the ugliness of peer pressure. The minor hand-to-hand anxieties evolved into perpetual worry. My mind fretted over whether my kids would endure emotional scarring, succumb to the plague of insecurity, and have the willpower for self-control. These normal, universal childhood struggles were crushing my mom heart. Observing my kids navigate their adolescence was agonizing because my past is littered with tripped emotional land mines, most of which exploded in my tween years. My innocence was stolen early on, leading to chronic brokenness and vulnerable self-worth. The desire to inoculate my kids from contracting similar diseases, regardless of the source, consumed my spirit, allowing fear to launch a menacing invasion on my home front. The high school years only heightened the intensity of the battle. Think driver’s licenses, dating, social media, and ramped up peer influence. Then imagine temptation around drugs and alcohol, prom nights, and all things wearing independence fatigues. Each pose as potential threats to the well-being of our kids as they emerge into adults. For this battle weary momma, the silent warfare caused a beat down. Then my kid’s high school, in which all three were enrolled, was the target of a merciless school shooting. An atomic bomb dropped into the inner chamber of my heart. Although my kid’s precious lives were spared, the trauma of the event contaminated every layer of my mom heart. It wasn’t until I ushered my last kid out the door, marking the beginning of empty nest, that I realized how debilitating the panic and worry had become. This past year, my kids, bless their beautiful hearts, risked exposing me to the ugly truth of my wayward parenting fears. One at a time, in different scenarios, they each gently brought to light that, although my intentions were good and from a place of love, many times my intercession in their life was morbidly bereft of strength. Rather, my fearfulness was poisoning their ability to grow, accept failure, endure necessary suffering, find their own way. I cry as I type this. Not because I’m beating myself up for the millionth time, but because my kids love me that much. They choose love over fear; modeling a healthier road map for me to follow going forward. Only God knows why I deserve these valiant angels of mercy who have met me at the front lines and placed a surrender flag in my hands. That’s what I hear them say even when their lips aren’t moving; their sentiment a tourniquet slowing the bleeding. 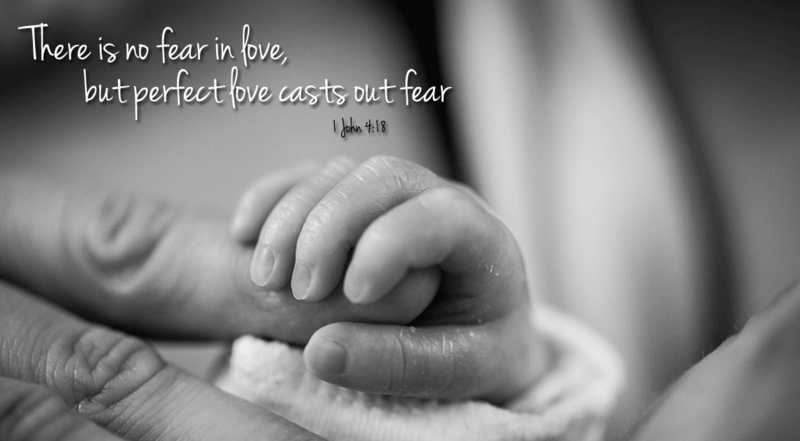 Every feeling, opinion, judgment, and attitude we have stems from love or fear. When we make decisions, the launching point will depend on how we feel in the moment. Our actions, in turn, project one of those attributes to our kids. How do we want our kids to approach life? How do we really want to approach life? My kids have cleared the way for love to conquer fear in my heart battle. All I need to do is surrender; be mindful of my heart’s condition. I’m doing my best. 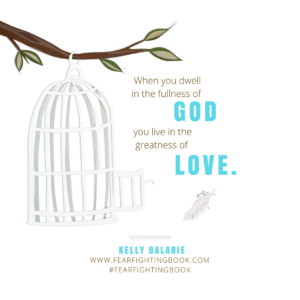 Friends, God blessed me with a wonderful message about fighting fear from the beautiful and talented author, Kelly Balarie, from Purposeful Faith. 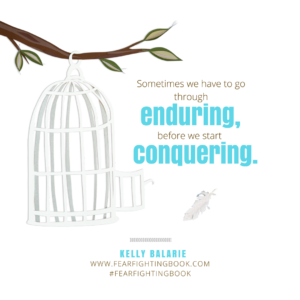 Her new book, Fear Fighting: Awakening Courage to Overcome Your Fears, has had wild success. As seen on the Today Show, Fear Fighting is Kathy Lee’s FAVORITE BOOK! I love this picture of you! It is how I remember you when I think of the good ol’ days of baseball with the kiddos…Johnny, Seth, Austin and Warren all on the same team! And I will never forget the Dylan “athletic cup” story! You have to fit that into your blog sometime..it is such a funny memory! Cheers and God bless you! Oh Shelby. My heart. And I’m not even a Mom!! Thanks for sharing from your Mom heart about the difference between love and fear (and acting out of them.) So helpful.